For other places with the same name, see Bagshot (disambiguation). Bagshot is a large village in the southeast of England. 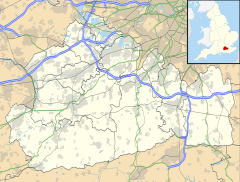 It is situated in the northwest corner of Surrey within the county's Surrey Heath council district, close to the border with Berkshire, and is also in the diocese of Guildford. In the past, Bagshot served as an important staging post between London, Southampton and the West Country. Evidence of this can be seen in some of the original coaching inns that are still there today. The village is situated 43 kilometres (27 mi) southwest of London, adjacent to junction 3 of the M3 motorway and is split in half by the A30 road, midway between Camberley and Sunningdale. Much of the surrounding land is owned by the Ministry of Defence. The area is in the Green Belt that surrounds London. It is served by Bagshot railway station. Recent excavations have shown that settlements of Bagshot date back as far as pre-Roman, before these excavations it was thought that the earliest settlements in Bagshot were late Saxon. Late Bronze Age settlements have been identified in the area, and iron smelting appears to have been a major 'industry' in the locality. Bagshot at one time included a Royal forest. It had a Royal hunting lodge certainly through Stuart and Tudor times, now called Bagshot Park, which is now the residence of Prince Edward, Earl of Wessex. In Elizabethan times (late 16th century) Bagshot prospered due to its position on the main London to the West Country road (The Great South West Road, now classified as the A30). As with many villages on main coaching routes, Bagshot developed services, inns for the stagecoach passengers, and stables to provide the coaches with fresh horses. Ann Nelson's "Exeter Telegraph" would stop for 20 minutes at Bagshot on its 17 hour journey to Devon. The prosperity of the Great South West Road created its share of highwaymen, one of the most notorious being William Davis, a local farmer who lived near what is known locally as the Jolly Farmer roundabout in Camberley. He was eventually caught at the White Hart Inn in Bagshot and later was hanged at the gallows in Gibbets Lane in Camberley. Not one to avoid suspicion he always paid his debts in gold! It was after him that the pub was called the Golden Farmer. The Golden Farmer (now Jolly Farmer), was eventually sold to American Golf Discount Store, who still use the old building. Burger King had plans to build a fast food restaurant there but has since been cancelled as the roundabout was considered too dangerous and was near Collingwood School. Bagshot has five churches: Church of England (St. Anne's); Roman Catholic (Christ the King); Methodist, Evangelical (Brook Church) and Jehovah's Witnesses. St Anne's Church is 120 years old and was built in a Gothic Revival style under the patronage of Prince Arthur, Duke of Connaught who lived in the nearby Bagshot Park. It is a building in red brick with stone detail under a slate roof. There is a bell tower with a peal of eight bells. It is a grade II listed building and is situated in a conservation area. Bagshot has two multi-purpose sports fields and a cricket field. Curley Park Rangers, the youth football club, meet regularly and play on pitches in both Lightwater and Bagshot. The CPR clubhouse is located at the Bagshot pitch. White Hart Royals, the football team of the White Hart pub in Bagshot village, compete in the Camberley & District Sunday Football League. Bagshot Cricket Club runs a number of adult and under 16 teams and complete in the Thames Valley League, the Three Counties League and the West Surrey Youth League. Bagshot Tennis Club has four floodlit courts and fields teams in the Woking League. Swinley Forest, which borders Bagshot to the north, provides some of the best mountain biking in South-East England, with many off-road 'single-track' trails available as well as plenty of fire roads. Mountain biking is permitted with a permit and walking is free. Swinley Woods was considered as a venue for the mountain biking event of the 2012 Summer Olympics. Other clubs and organisations include Bagshot Concert Band, the Surrey Heath Archaeology and Heritage Trust, Bagshot Gymnastics Club, Camberley and Bagshot Metal Detecting Club and local branches of the Scouts, Royal Air Forces Association, Women's Institute and Camberley Rifle & Pistol Club. It is also a short distance from The National Clay Shooting Centre and the Bisley shooting ranges. Bagshot library is situated on the High Street and in addition to the usual library services provides Story and 'Rhymetimes' for the local toddler community. Lightwater Country Park is accessible by crossing the M3 footbridge. Pennyhill Park Hotel located at the far western edge of Bagshot is where the England rugby team train. Bagshot Park, home of Prince Edward, Earl of Wessex is located on the northern edge of the town. The A30 leaving Bagshot to the southwest for Camberley has a large roundabout on it called the Jolly Farmer after a public house that used to stand in its centre, now used as a Golfing Store. The local borough, Surrey Heath, is mainly a Conservative area and it has held a Conservative council for the past 50 years. Bagshot itself is, however, represented by two Liberal Democrat and one Conservative borough councillors. Bagshot is working (2009/2010) on a Village Plan. The Bagshot Village Plan aims to pull together the people of Bagshot's collected hopes and concerns for the community and to set out a plan for making Bagshot an even better place to live and work. Some large companies are based in Bagshot, including Big Yellow Self Storage, and the Wooldridge Group. ^ "Bagshot Key Figures for 2011 Census: Key Statistics". Neighbourhood.statistics.gov.uk. Retrieved 3 July 2015. ^ "About Bagshot Village". Bagshotvillage.org.uk. Retrieved 22 May 2015. ^ "The Project Gutenberg eBook of The Exeter Road, by Charles G. Harper". www.gutenberg.org. Retrieved 2 September 2018. ^ "Bagshot Village – St Anne's Church". Bagshotvillage.org.uk. Retrieved 22 May 2015. ^ "Bagshot Village – Duke of Connaught". Bagshotvillage.org.uk. Retrieved 22 May 2015. ^ "England choose Pennyhill Park" (PDF). Pennyhillpark.co.uk. 21 August 2008. Archived from the original (PDF) on 5 October 2011. Retrieved 22 May 2015. Wikimedia Commons has media related to Bagshot. Surrey County Council. "Bagshot". Exploring Surrey's Past. Retrieved 30 May 2017.